Our new retail shop is now open! 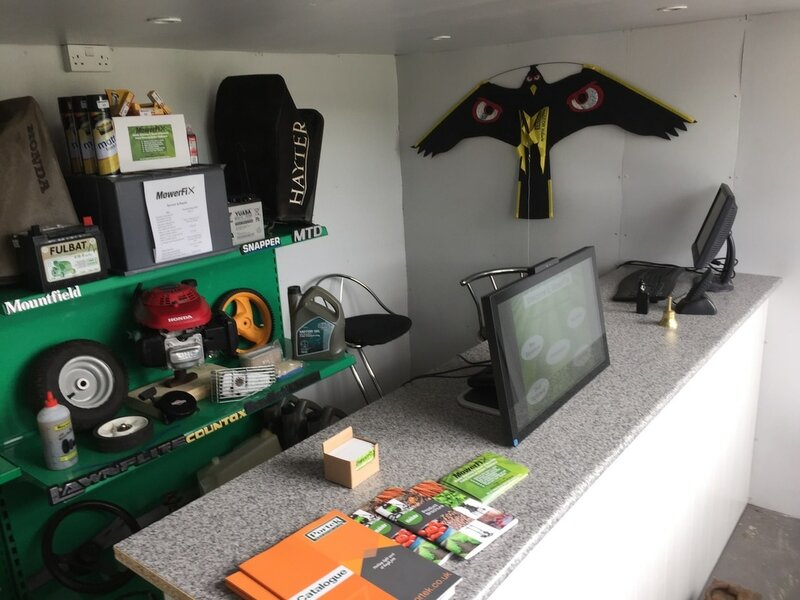 Our retail shop may be small but it's packed with all the products you need to keep you going through the mowing and garden care/maintenance season. We've personally and carefully researched and tested all of the new machinery and new parts that we stock. At MowerFix we won't sell you a new product that we wouldn't happily buy and use ourselves. Demonstration models available of most products for you to see and try. Just as with our Servicing and Repairs we strive to keep our overheads low, meaning that we can pass on the savings to our customers. Need a new spark plug, air filter or starter rope? MowerFix has got you covered. We have a good range of the most used consumable items you need to keep your machinery earning its' keep. We'll happily order any other new part that you may need for your machine if we don't hold it in stock. Got an exhaust with a hole in it? There's a tear in your grass bag? Engine made a loud noise and now it doesn't work? Your mower handles are held together with gaffer tape and hope? We've all been there. You've probably looked at getting a new part for it but have been put off by the price. You just want to get to the end of the mowing season and then assess your options. Replacement machine next year perhaps? We have a large stock of used parts to fit many makes and models of machine, both pedestrian mowers and ride-on machines. ​We have a limited stock of complete replacement engines, many makes (including Honda) and many different power outputs. ​As a general rule of thumb the majority of our used parts are in the region of 50% of the price of the equivalent new part. Half price for something you probably only use for half the year anyway? Makes sense to us. A selection of what we usually have available is listed below.